It breaks for Easter from April 12 to April 21st inclusive. 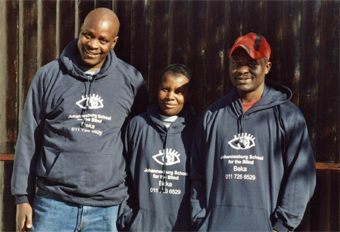 The Johannesburg School for Blind, Low Vision and Multiple Disbility Children started in January 2003 at 35 Lothbury Avenue, Auckland Park, thanks to the great kindness of Margaret Hirsch and her husband Allan, who jointly purchased the building. The project has been initiated by Children of Fire but will soon be set up as a separate charity, either as a section 21 company or a registered non profit organisation. Trustees designate include both the Hirsch's, Lisa Hutchinson, Lorraine Doyle, Astrid Meyer, Bronwen Jones and Prakash Naidu. Moray Hathorn of Webber Wentzel Bowens has agreed to assist with the legal work in establishing a new trust. 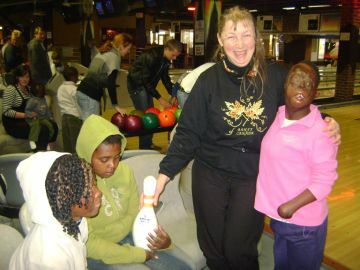 A pro-Deo Advocate from another law firm is assisting with a forthcoming Constitional Court Action to insist that the South African Government must equitably fund education for all disabled children, especially if it does not manage to make its stated policy of inclusion work in practice. 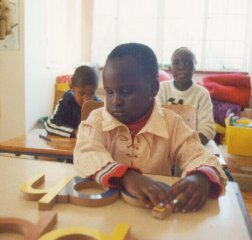 Michael Said of Mugg & Bean donated three sets of 15cm high wooden letters for children without fingers and significant sight, to be able to feel the alphabet. 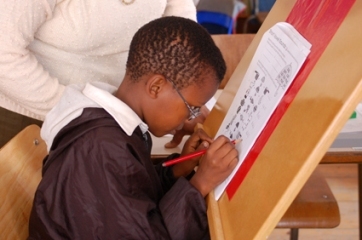 Children of Fire International has contributed towards teaching costs for six months. 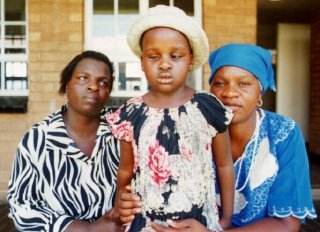 The first pupils are Dorah (aged 8, burned and almost no vision), Raeez (age 7, blind from premature birth), and a series of burned children who are being taught as they await surgery. 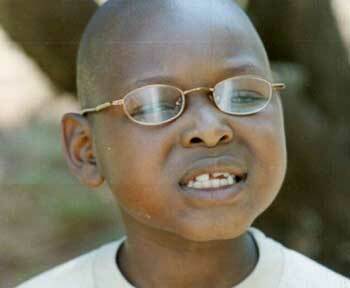 These have included Jeffers, Bongani, Londeka, Phindile and also Slovo-resident Lucky Boy. Most of these children have their own section on the website. 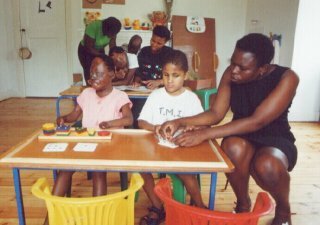 One child has been attending therapy at Hope School. That school's co-operation is appreciated. 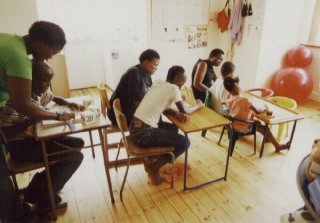 The nearby Milpark Primary School has also helped with course material for older children, especially in grades 2, 4 and 6. 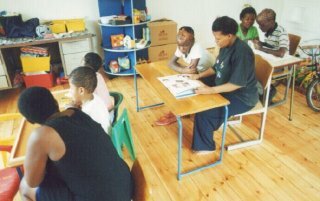 Working hard in the first classroom at the Johannesburg School for the Blind. 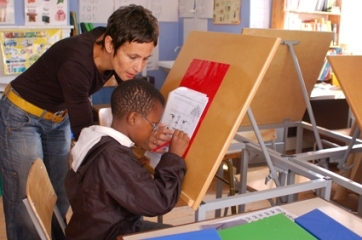 Johannesburg School for the Blind - the week's learning theme was transport. 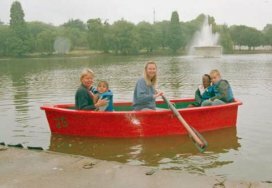 Dorah was lucky that her brother was off school, so that he could help... but he wasn't much good at rowing with his broken left arm. Astrid is acting principal 2 days a week (voluntary, no salary) and Lisa (rowing) helps out in a variety of ways. 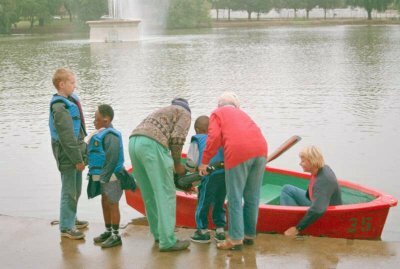 Raeez age 7 (normally hyperactive and quite difficult to deal with despite being blind) was scared to get in the boat and to remain in the boat until he got used to the unusual movement. 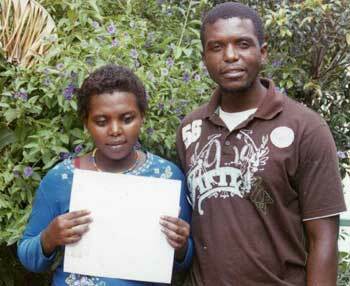 The burned children were not at school that day and the next blind child probably starts on Tuesday. 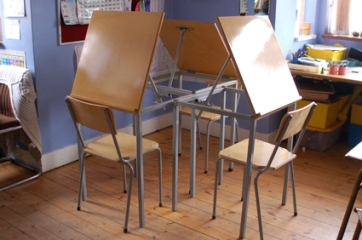 At the school there are special sloping tables for low vision pupils. Working at a sloping table is better ergonomically for the child's back because she or he doesn't have to bow her/his head to focus on work. 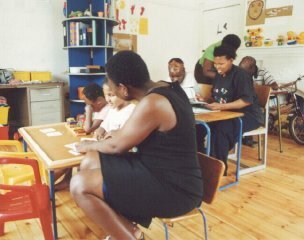 Sitting at a sloping table the child has a good position to look, to read and to write.